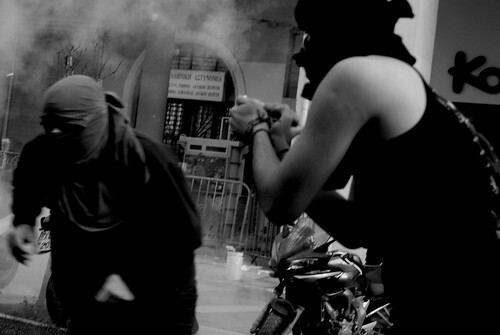 Greek general strike 29/06/2010 - Thessaloniki, originally uploaded by Teacher Dude's BBQ. 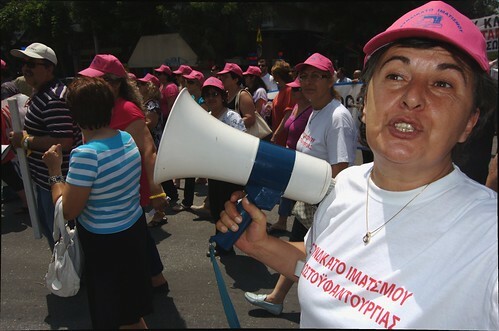 Between 8,000 and 10,000 striking trade unionists took to the streets in the northern port city of Thessaloniki in order to show their opposition to the recent austerity package which they claim will plunge millions of Greeks into poverty by allowing mass redundancies and by cutting pensions. 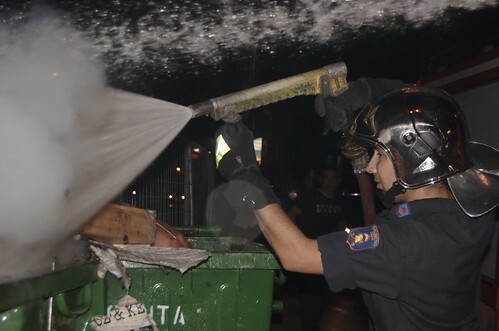 Greek riot police teach the true meaning of culture at book signing - Thessaloniki, Greece, originally uploaded by Teacher Dude's BBQ. 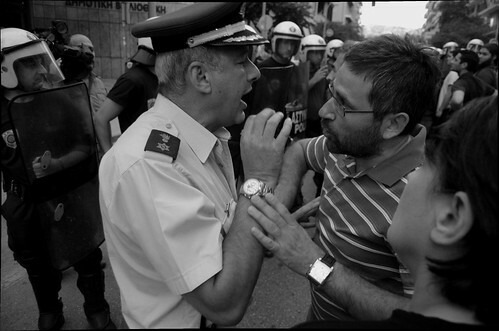 The attendence of two government ministers, Anna Diamantopoulou and Evangelios Venizelos at a book presentation in the northern port city of Thessaloniki led to tense scenes between the riot police and teachers. Greek education minister fails to show up for school ground breaking ceremony following protests, originally uploaded by Teacher Dude's BBQ. But Diamantopolou didn't show up despite having announced her programme to the press. I doubt that the sight of jeering teachers would go down well on TV so she opted out. It's a a measure of just how unpopular the ruling PASOK party are that they cannot visit any open air event without drawing vociferous protests. Smoking gun, originally uploaded by Teacher Dude's BBQ. 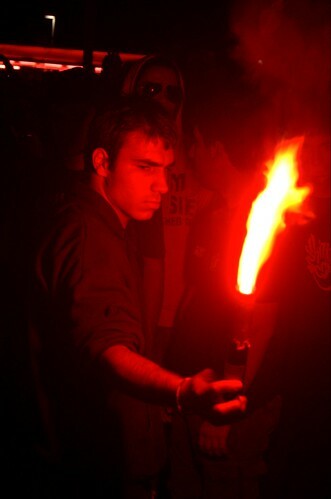 Taken at a street party a few weeks back. 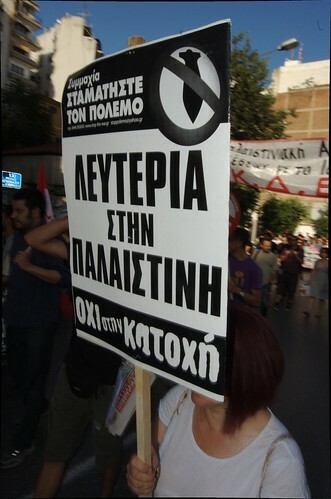 Greek trade unions organise general strike and marches nationwide, originally uploaded by Teacher Dude's BBQ. So what does one do on a visit to the nation's capital? Take in the sights, hit the museums, perhaps just enjoy the night life? Or take in a demonstration or two? Yesterday I was in Athens for a job interview so I spent most the night on a coach which dropped me in the capital at 6.30 am, which, believe it or not is a great time to arrive in the city. The weather was great, the streets relatively quiet and so I had the chance to kill time before my midday appointment walking through the Plaka district, taking in views of the Acropolis at dawn and to get ready for the protest marches set to start at 10am. Always like to mix business and pleasure, you see. So after marching along with the PAME trade unionists who were demonstrating against the government's latest hair brained scheme to cut costs (Pensions? Who needs thems?) and make firing employees easier (Yep, with close on a million out of work sacking people is apparently so difficult that PASOK has given employers a helping hand). The march was a peaceful affair and wound its way through the centre and passed by the Greek parliament under the watchful eye of enough police manpower to pacify Somalia. Then, much in the manner of Clark Kent I transformed myself back into my daytime persona of a mild mannered teacher, complete with tie and shiny shoes to go to the interview. Not sure if I got the job but fingers crossed. Just found out that I got the job. Once again the wolf at the door goes hungry. Let's hope the rest of summer is as good. On parade, originally uploaded by Teacher Dude's BBQ. "Law never made men a whit more just; and by means of their respect for it, even the well-disposed are daily made the agents of injustice. A common and natural result of an undue respect for law is that you may see a file of soldiers, colonel, captain, corporal, privates, powder-monkeys, and all marching in admirable order over hill and dale to the wars, against their wills, ay, against their common sense and consciences, which makes it very steep marching indeed, and produces a palpitation of the heart. They have no doubt that it is a damnable business in which they are concerned; they are all peaceably inclined. Now, what are they? Men at all? or small movable forts and magazines, at the service of some unscrupulous man in power? The mass of men serve the State thus, not as men mainly, but as machines, with their bodies.... In most cases there is no free exercise whatever of the judgment or of the moral sense; but they put themselves on a level with wood and earth and stones; and wooden men can perhaps be manufactured that will serve the purpose as well." 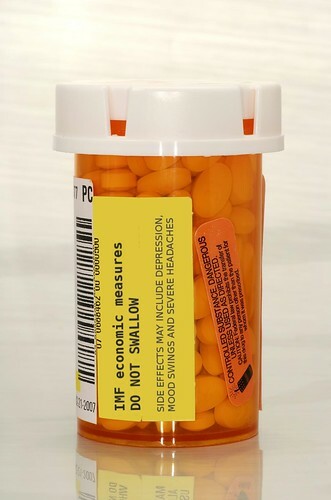 IMF Economic Measures - Do not swallow, originally uploaded by Teacher Dude's BBQ. SIDE EFFECTS MAY INCLUDE DEPRESION, MOOD SWINGS AND SEVERE HEADACHES. 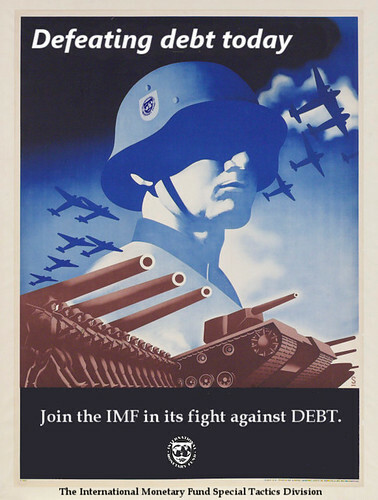 Defeat Debt - Join the IMF, originally uploaded by Teacher Dude's BBQ. Using images to get your social media message across - a beginner's guide. 1 - Why use photography? 2 - Basic tips on taking better pictures. 3 - Using image processing programs such as Picasa and GIMP. 4 - Where to put our images on the internet. 6 - Legal aspects of taking pictures in public spaces. 7 - Turning still images into video clips. The idea is to teach beginners all the practical skills necessary to take better pictures using everyday, simple tools such as mobile/cell phones or compact digital cameras and then how to use those images to get their message across in a more effective manner than by just using text. The seminar takes about three hours and is focused mostly on learning by doing rather than just learning theory. At the end of the session participants will be able to immediately apply what they have learnt in any kind of social media based campaign. As this is a practical seminar I can only give a general outline of the points covered. To get into more detail then it's necessay for me to do it in person. Iraklis FC supporters in protest march, Thessaloniki, Greece, originally uploaded by Teacher Dude's BBQ. Although Greece's economic crisis and the possible relegation of a football team may have, at first glance very little in common, the story behind the possible expulsion of the country's oldest club from the Superleague encapsulates many of the pathologies that have led to the country's present dire financial sitiuation. Abuse of power, lack of transparency, hints of corruption and an absolute distrust of those in authority are some of the common themes that link both stories. Fans of Iraklis FC are convinced that the decision to not allow their team to take part in the Superleague is the result of shadowy, forces who are playing fast and loose with the rules that decides such matters to force the team out. Fans add that the same charges that have been levelled at Iraklis over financial oversights and debts are also valid for many other teams. Whether the fans claims have any vailidity or not is less important than the insight into how ordinary Greeks view the authorities, be they connected with sport or politics in general. The fact that accusations of abuse of power and corruption are so readily accepted comes from the seemingly endless stream of scandals that make up Greek public life and which the present political system not just tolerates but actively encourages. While PM Giorgos Papandreou may claim that his party is going to clean up this particular Augean stable the reality is that few believe that he is willing or able to change the intricate web of patron-client relations that make up the foundation of modern Greek party politics. Indeed many members of Papandreou's own party have much to fear any such clean sweep as PASOK has a long and rich history of financial irregularities from its time in power, one of the reason why it lost two general elections in 2000 and 2004. One only has to look at Parliaments handling of the Siemens bribery scandal which has been rumbling on for years. The revelations that the German corporation had a 100 million euro slush fund which it used to win contracts and favours from both PASOK and New Democracy whilst they were in power have simply confirmed Greek voters' worst suspicions about the country's political caste. The case only came to light after German public prosecuters brought charges against the company for bribery. Even after the facts of the case became known the Greek parliament dragged its feet and made sure that the investigation never uncovered the culprits. A farce which is currently being repeated and in all probability will not not lead to any prosecution despite mountains of evidence. Given this and the dozens of other scandals that have come to light over the last few years Iraklis supporters and Greek voters in general can hardly be blamed for seeing those in authority as little more than thieves and liars. Similarly, the fact that their sense of outrage and frustration over the way things work finds expression in a seemingly endless series of marches and demonstrations which often boil over into angry outbursts starts to make sense in a system were checks and balances on power are little more than a constitutional abstraction. It must be the World Cup, well that and the fact that Thessaloniki is experiencing its first heatwave of the summer with temperarures in the mid 30s C. I went to the seminar I was meant to be presenting today only to be meet with zero students. I guess the fact that today's match started at 5pm and the lesson was scheduled to kick off at 6pm must have something to do with it. Oh well, so much for the time I spent on preparation yesterday and today. Still, since the heat just saps the energy right out of you, maybe its a good thing. Under Cover of the Night, originally uploaded by Teacher Dude's BBQ. 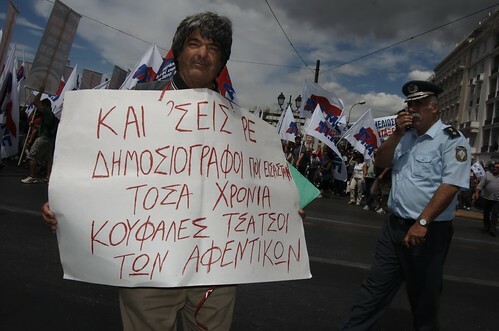 Greek trade unions in anti-government march - Thessaloniki, originally uploaded by Teacher Dude's BBQ. According to a new opinion poll carried out by Public Issue confidence in the present government and the political system in general is in freefall. Just 18% of Greeks believe that the country is on the right track, (down from 38% in February) and that 84% of those polled are unhappy with the state of democracy, a figure that is reflected in approval ratings for the two major parties, PASOK and New Democracy who scored 18% and 9% respectively. 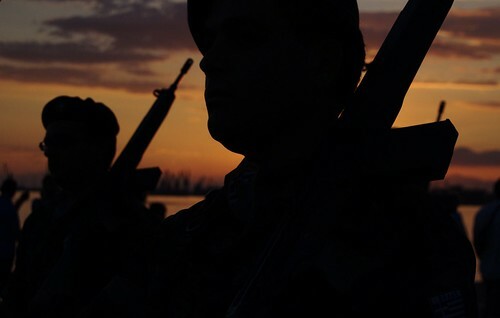 "On the night of Sunday, May 30, showing a terrifying disregard for human life, Israeli naval forces surrounded and boarded ships sailing to bring humanitarian aid to the blockaded Gaza Strip. On the largest ship, the Mavi Marmara, Israeli commandos opened fire on civilian passengers, killing at least 9 passengers and wounding dozens more. Others are still missing. The final death toll is yet to be determined. Cultures of Resistance director Iara Lee was aboard the besieged ship and has since returned home safely." With the summer finally here it would be nice just to enjoy the sun and forget our worries with some time at the beach. However, no matter good the weather is the fact still remains that the Greek economy is in serious trouble with signs of economic decline appearing everywhere from the sight of pensioners dumpster diving to the fact that consumers are cutting back even on staples such as milk and other diary products. Even with the help that people have been so generous in giving me after the break - in I am still wondering how I'm going to get through the next three months, traditionally a period when people are not interested in doing English lessons. On the other hand I see people especially those who live in the poorer neighbourhoods on the west side of the city for whom the coming summer is going to be a fight for survival. Contrary to what you may have read in the foreign press about profligate Greeks living high on the hog there are millions of ordinary people who are worried over how they are going to pay household bills and feed their families. These are Greeks on lower incomes (some of the lowest in the EU) who do not have a steady income, jobs in the public sector and who saw little or nothing of the massive state expenditure racked up by previous governments. These are the Greeks who are obliged to send their kids to dire state schools, live in areas with lousy roads, high crime and virtually non-existent public services. They are the Greeks who take their risks in a public health service which is running out of basic medical supplies and in many cases do not have the staff to offer proper emergency care. To add to their burdens Greece is currently in the grip of an inflationary cycle with prices rising by 5.4% , three times the Eurozone average. Much of this increase is fuelled by rises in VAT and indirect taxes on petrol and much due to ever present price cartels which make sure that competition is in name only. With shrinking incomes comes rising unemployment, especially for the young and women who were already disadvantaged in the job market wages have fallen still further leading to a slow death dive in which less and less money is available which in turn results in demand shrinking and so yet more job losses. It's very hard to see how the economy is going to avoid this. Despite talk of PM Giorgos Papandreou's talk of stimulating development the reality is that the government has little to offer other than words. What seems likely is that whatever promises the present socialist PASOK government has given to the IMF/ECB in return for further bailout money are going to be harder to keep. Not simply because the austerity measures they demand are causing massive social upheaval but also because with the Greek economy tanking sources of tax revenue are drying up faster than a puddle in Death Valley. Those who made their billions through their political and personal connections with the two major parties have long since made sure that their wealth is beyond the reach of the taxman, leaving Athens to grab what it can from those citizens who do not have access to Swiss bank accounts or off-shore companies. As the Greek parliament once again goes through the annual charade of investigating itself for corruption and once again manages to avoid bringing even one of their ranks to justice the rest of Greece looks on disgusted with this particular puppet theatre, convinced that whatever political capital PASOK and New Democracy had has long since vanished. 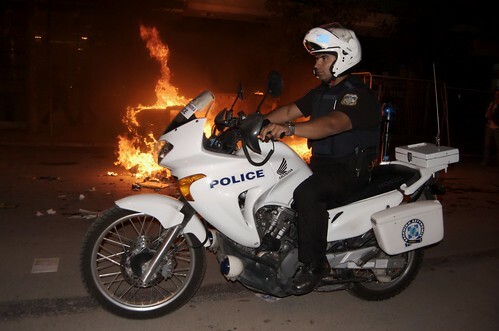 Riots in Thessaloniki - Greece, originally uploaded by Teacher Dude's BBQ. 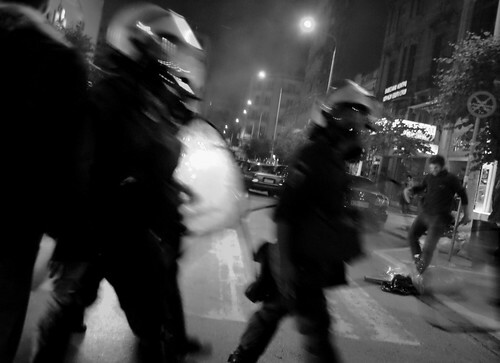 Despite being witnessed by dozens of people in the neighbourhood and part of it captured on video Greek courts were unable to convict police officer, Epameintas Korkoneas who on December 6th shot and killed 15 year old Alexis Grigoropoulos in Exarchia, Athens. As 18 months had elapsed since the officer's arrest the court was obliged to set him free. 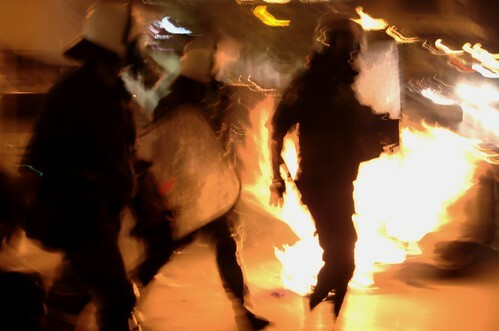 The death sparked off riots that lasted nearly a month and cost the country billions in damages as outraged Greeks repeatedly clashed with police across the country and produced the worst civil unrest in a generation. The ferocity of the response was, in part fuelled by the conviction that the police officer would not be punished. It seems that the officer has been released but the trial is set to continue. The 18 month limit was how long somebody could be held pre-trial before the courts were obliged to release them. Thanks to blogger Lollipop for putting me right on this. 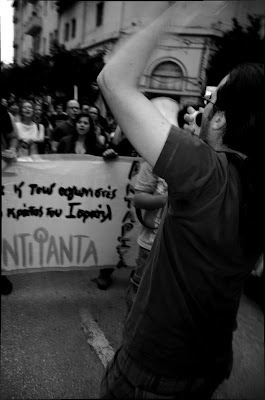 Iraklis FC supporter protesting near the White Tower - Thessaloniki, originally uploaded by Teacher Dude's BBQ. Thousands of supporters of the local Iraklis football club marched through the centre of Thessaloniki in protest against the decision of the Greek football licencing board to not grant them permission to take part in next year's Superleague, effectively relegating the team. 2010 Thessaloniki Naked Bike Ride, originally uploaded by Teacher Dude's BBQ. For the third year running hundreds of cyclist, roller skaters and wheelchair users rode through the streets of Greece's second largest city as part of the World Naked Bike Ride which aims to draw attention to the role of bicycles as ecologically friendly alternatives to motor cars in urban areas. 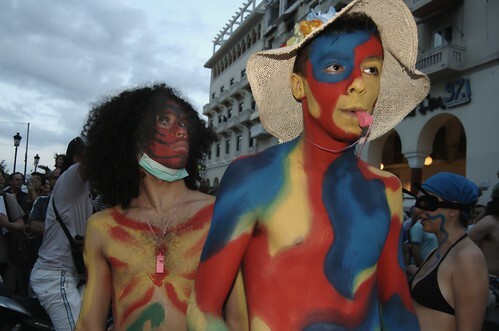 Although billed as a naked bike ride participants dressed upin beach wear and body paint in order to avoid clashes with the authorities who arrested people taking part for "unseemingly behaviour'. 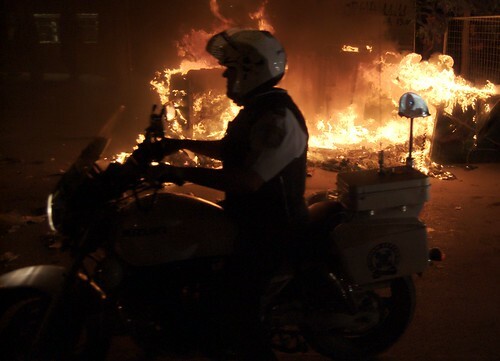 Despite the firendly atmosphere more than 30 members of the police rapid response motorcycle unit and riot police squads followed at a discreet distance. According to organisers more than 800 people took in this year's event, more than double last year's figure and the 150 who participated in the first ride in 2008. 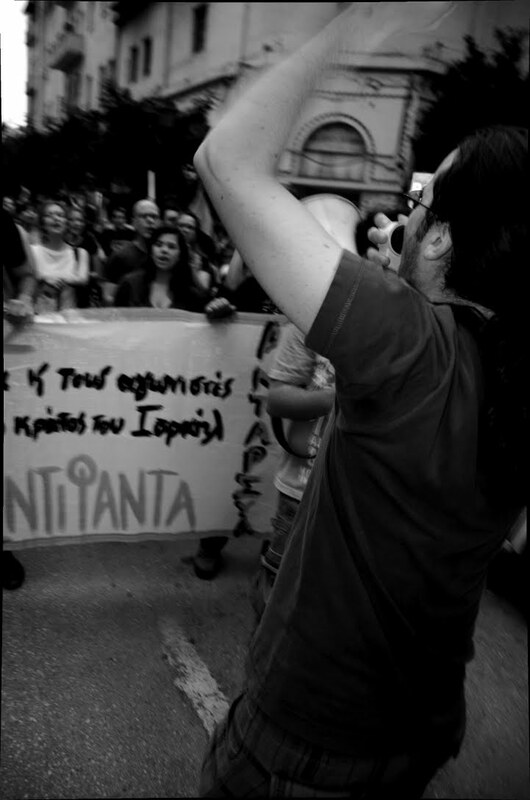 Greek demonstration in support of Gaza - Thessaloniki, Greece, originally uploaded by Teacher Dude's BBQ. As I write this another ship, the MV Rachel Corrie carrying aid to Gaza is making its way towards Israeli waters in defiance of prime minister Benjamin Netanyahu who has vowed to stop the Irish vessel from making landfall. Last night about 500 people took part in a march in the centre of Thessaloniki in support of the Palestinian people and the lifting of Israel's blockade of the Gaza Strip. 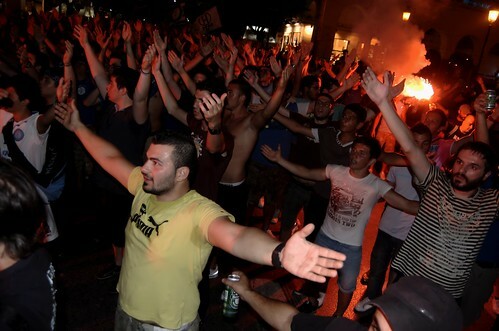 Fans of Iraklis FC riot over relegation decision, originally uploaded by Teacher Dude's BBQ. 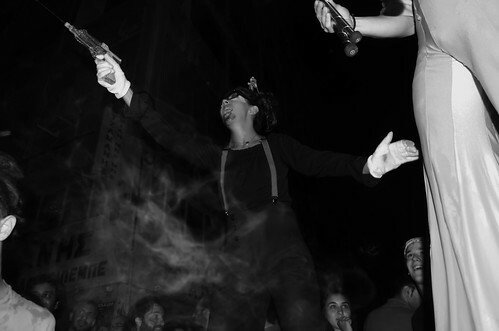 Fans of the Ιraklis football team took to the streets in the northern Greek city of Thessaloniki. 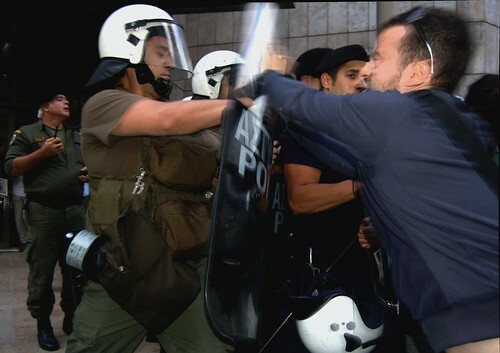 Angry over the decision to relegate the city's oldest club supporters fought with riot police yesterday evening in a series of confused clashes in which the authorities used tear gas, flash grenades and specially trained motorcycle units to break up the march. Thanks to Asteris for lending me his camera. Promise I'll not lose this one and who knows he may even get it back in one piece. The Freedom Flotilla was, according to Israeli deputy foreign minister Daniel Ayalon, "an armada of hate and violence", full of vengeful terroristsympathisers with connections to al Qaida. The video released by the IDF purported to show Israeli soldiers comming under attack from so - called peace activists armed with knives, metal bars and even guns. In addition Israeli TV aired footage of defence forces uncovering caches of weapons hidden amongst the "humanitarian aid" that the turkish cruise ship Mavi Marmara was carrying to Gaza. However, Tel Aviv's propaganda machine did not take into account the fact that some footage, no matter how brief would escape their hands and spill out into the world and so spoil their neatly honed version of events. Images of passengers fighting machine gun wielding special forces commandos with little more than deck chairs and poles and paying for their defiance with their lives brought to the world's attention the brutality of the military operation which took place in international waters, far from Israeli territory. As more and more members of the Flotilla return to their home countries, including Greece eye witness accounts contradicting official Israeli accounts are starting to come out. According to Greek activists deported two days ago passengers aboard the Greek sponsored Free Mediterranean were beaten and attacked with tasor - like weapons and that shots were fired even before special forces boarded the ship. According to the Greek language Ship to Gaza website violence against those held continued even after their transfer to Israeli jails. The news the deaths of those onboard has provoked a storm of reaction here in Greece as in many other parts of the world. Just hours after the story broke protest marches were organised in 21 cities across. Here in Thessaloniki thousands took part in marches condemning the killings and the demonstrations are set to continue in the forseeable future with many groups vowing to not let the deaths be in vain. 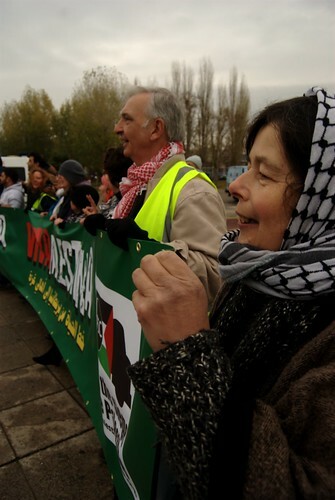 Twice in the last year I have covered events by groups who wanted to send aid to Gaza. In December the Viva Palestina aid convoy passed through the city with dozens of ambulances filled with medical supplies for Palestinian hospitals and during their two day stay here I had the chance to talk with those taking part. These were not the terrorists or fanatics that the Israelis would have us believe but rather ordinary people moved to help in what they see is a noble cause. I was moved by their passion and commitment which was not feigned or forced, the participants deeply impressed me with their moral strength and courage. 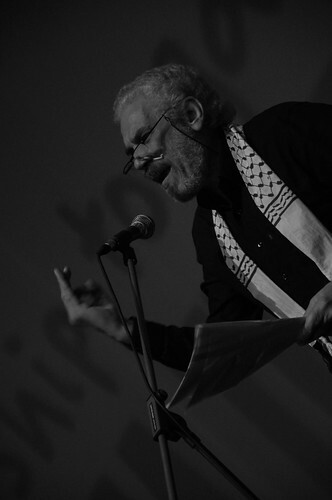 More recently I was asked if I could photograph a benefit concert which was held here to raise money for the ship that was stopped on its way to Gaza. Once again I was struck by the fact that so many were willing to donate time and money to the effort and that the atmosphere was one of friendship and solidaity rather than hate and mistrust. Unlike so many tragedies we witness on our TV screens or read about on the internet this one touched a chord within me as I had, albeit slightly been involved with some of those present and had the chance to judge for myself the intentions and character of those taking part. This made me hate the claims made in defence of the killings all the more vile, a crime committed to hide even more heinous crimes. Yet as we have seen in so many other situations in which states use violence to deal with political questions the first reaction after the bullets have been fired and the bodies collected is the vilifcation of the victim, a concerted attempt by the authorities to "prove" that their use of murderous force was, as always, justified. Once again thanks to Asteris for lending me his camera and o allowing me to carry on photographing what is happeneing here. I would like to say a heart felt thank you to everyone who has sent money and offers of help over the last few days. Also those people who have helped me get through this difficult time with their kind words and support. You have no idea how important this has been in getting me through this horrible experience. I haven't been ignoring what has been happening both here in Greece and the wider world but it has been hard to get the energy to write about how I feel about recent events. I will be updating the blog more regularly in the days to come and as I now have access to a camera (thank you Asteris for lending me yours) there are pictures as well.